ECI Media Management branched out a representative office in Moscow in partnership with KWENDI+RMA. ECI Rus will serve ECI Media Management customers on media audit in Russian Federation. Dmitry Kuraev, the managing partner of KWENDI+RMA, is appointed as the head of the new company. ECI Media Management was established in 1990 and is in TOP-3 media audit international companies. The company provides services in all key advertising markets in North and South America, Europe and Asia. KWENDI+RMA was founded in 2010. It is the largest media audit company on the former USSR territory. 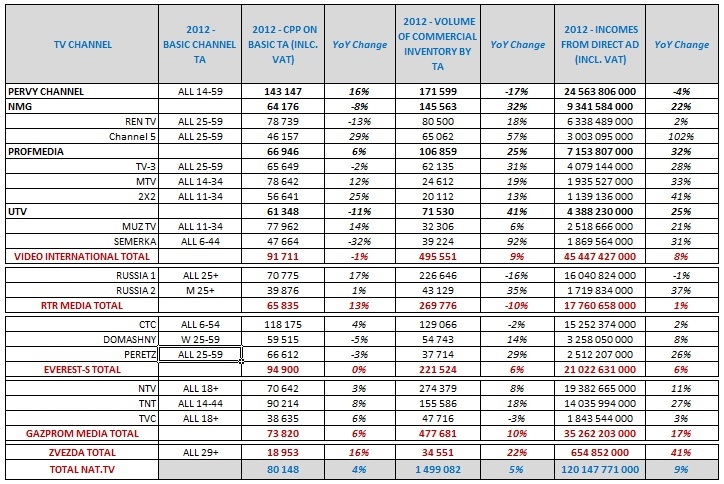 The women TV channel «U» is only 10th on the advertising revenues among 17 federal broadcasters, according to Kwendi Rusmediaaudit data, calculated for RBC. But, as it turns out , it is the very channel, that monetizes its audience much more effectively than the market leaders – "First channel" and NTV. Kwendi Rusmediaaudit has evaluated the average cost of 1 GRP on 17 federal channels on the basis of 2013 especially for RBC. The company is engaged, inter alia, in analysis of how effectively advertising agencies buy TV advertising for their clients (each advertiser depending on budget, purchase history, set of channels has its own conditions), and thus is able to determine the effective cost of advertising on federal TV air, taking into account all sorts of discounts and bonuses. Moreover, in their assessments Kwendi Rusmediaaudit focuses on the already mentioned financial statements of broadcasters from open sources. Allowable error in the calculation is +/- 10 %, according to Kwendi Rusmediaaudit CEO Dmitry Kuraev. Video International, the largest Russian TV advertising seller may change CEO. Sergey Vasiliev, who heads the group since 2003, is likely to leave his post before his term ends, and may be replaced by Eduard Raikin, who is the head of the First channel in St. Petersburg. In 2012, 13 channels, served or consulted by VI, could earn only at the national TV advertising placement, according to Kwendi RusMediaAudit evaluation, 90.4 billion RUR incl. VAT ($ 2.9 billion). Therefore the revenue of VI at the average with commission of 12% could make 10.8 billion RUR ($ 349 million). Global advertising holding companies Omnicom Group Inc. and Publicis Groupe SA announced a merger. This information is published on Omnicom site. The combined company will be called Publicis Omnicom Group. The merger is intended to strengthen the position of companies on emerging Asian and Latin American markets, including the flexible price policy. I suppose that the congregative process won’t reach the Russian market quickly – Omnicom has not completed the merger of its Russian assets. Moscow market continues to distinguish OMD «of Dmitry Dmitriev» and OMD «of Andrey Brajovich». When the merger happens, advertisers are unlikely to notice the benefits for themselves. Buying Power of these giants separately is already very strong and it seems doubtful that sellers of advertising opportunities will be ready to further «sag». At the same time, I agree with those who believe that the dream of leadership may lead to a decrease of agiencies’ motivation and, as a consequence, reduce the quality of the product to customers. According to Lenta.ru, the value of dollar in Russia will go up to 32,5-33 RUR. This conclusion is made by the majority of investment banks surveyed by the editorial staff. Thus, the U.S. currency will strengthen on 02.01 RUR. What does this mean for the advertisers? First, devaluation may stimulate the growth of the consumer market. First of all, the advantage will be taken by the producers whose production is fully or partially within the Russian territory. Secondly, it means an additional inflation factor for advertising: the growth of the consumer market will raise the demand for TV advertising, and the devaluation of RUR will encourage owners and ad sellers to (at least) fixing of prices in strong currency. Don’t forget that most of the contracts on TV advertising have a "currency clause", which allows to review the fixed prices on TV advertising in the case of long-term exchange rate of RUR against USD by more than 15%. RBC Holding jointly with Ukrainian Kwendi expert group prepared the rating of the largest media companies on former Soviet countries’ markets. The first ten of largest holdings included only Russian media giants. The analyses identified the top 25 holdings on the basis of several criterias. The company's revenue for the year shows the financial success of the media business. Weekly audience reach demonstrates the scale of the media resource. Using the "Information influence" criteria the editorial staff determined how influential the resource is and how effectively is each media company able to convey the most important content to consumer – the news. Finally, the evaluation of the technical coverage gives an idea of the technological capacity of the market and the potential of the company. Independent auditors, which were invited at the initiative of TV industry expressed their wishes for the telemetry system. In particular, TNS Russia was given a recommendation to increase the panel sample to 5-5.5 thousands households and include more cities – about 122 instead of the current 72 settlements with a population higher than 100,000 people. At the same time, experts recognized that the measuring project is well organized, in line with international requirements and is ready for the transition to digital broadcasting standard, – reports Sostav.ru. Dmitry Kuraev, Kwendi+RMA partner: "TNS Russia company is a recognized provider of industry data for a long time. The level of confidence in their data is traditionally high. However, in the current situation of "natural monopoly" the audit does not seem excessive". Expert evaluation of direct advertising and sponsorship spendings volume. Expert evaluation of advertising incomes is based on sponsorship materials volume in the monitoring by TNS Russia, expert evaluation of their value and analyses of information from other open sources. Integration of products/brands into TV show storyline / product placement is not taken into account. Possible error of advertising incomes in channel by channel evaluation can reach +/- 10%. TOP managers of 5 leading Ukrainian advertising holdings estimated the level of media-inflation in 2012 on demand of Kwendi Media Audit. The least rise in prices experts forecast in Print – about 5%. The scatter of results is between 0% and 10%. Also, respondents had similar estimation of Ukrainian TV inflation – average result is 10% with variations from 5% to 15%. Svetlana Kalinina, managing partner of Kwendi Media Audit: «I consider these results are important, because they are based on the opinions of all key market players. Their expectations significantly influence on the reality. In addition, I don’t see any other transparent tool for estimation of Ukrainian media-inflation». Svetlana Kalinina: «TV and Print measurements are the most exact and these markets are the most structured – that’s why evaluation difference is non-essential. Situation in other media is different. For example, OOH market may significantly change relating to the quantity of sites, removed by municipal authorities. It effects on the possible inflation». TOP media managers of all largest Ukrainian advertising holdings (Publicis Groupe Ukraine, Aegis Media, OMD Ukraine, ADV Ukraine and Group M) participated in the questioning. Forecasts don’t take into consideration the influence of possible global changes in economics. KWENDI Media Audit (Ukraine) and RusMediAudit (Russia) created joint company KWENDI+RMA with total billing about €500'000 in 2010. The company will be the biggest media auditor at the former Soviet Union. KWENDI+RMA provides media audit, pitch management, media strategy and media planning assessment as well as competitive analyses, and the general expertise of the CIS media markets, currently providing media consulting services to more than 70 brands. KWENDI+RMA makes considerable investment in the research and at the moment is the only CIS media auditor officially subscribed to the TV Audience Measurements in Russia and Ukraine. "Merger of KWENDI and RMA teams knowledge and experience will give unique possibility to ensure prices and quality of media planning and buying", - KWENDI partner Andrey Taranov said, - "For now on international companies won't need to separate contractors in each country ‘cause KWENDI+RMA provides professional media audit centralized. This significantly saves resources and simplifies communication. We are very glad that it's RMA who becomes our partner - it is the best, in our opinion, media audit company in Russia". General Director of RMA Dmitry Kuraev added: "Our possibilities make a perfect match. RusMediaAudit perfectly knows Russian market and KWENDI Media Audit has the most solid team of media experts at the former USSR territory. They superbly know both Russian and Ukrainian markets. Before launching this joint venture we've got trial period 6 months working under partnership agreement and I daresay both sides were extremely satisfied with the results". KWENDI+RMA works with customers in Russia, Ukraine, the CIS, and other East Europe countries. Partners' portfolio consists of more that 25 tender pitch managements, and more that 400 media audit projects. Proven high professional level of the team enables us to act as a local representative for Billetts, Etat Control, EMM, and others. RusMediaAudit has signed a contract with TNS Russia, making it one of the first Russian media auditors to use the company's profound data base. Most of the Russian media auditors are currently getting their research data from their clients' media agencies. "The contract we have just signed adds competitive edge to RMA's offering as our experts will get an on-line access to the latest TV audience measurement data as well as the Russian advertisers' activity - thus providing prompt and reliable reports to our clients ", Dmitry Kuraev, RMA Managing Director said. Media auditing companies KWENDI Media Audit and RusMediAudit have signed memorandum on exclusive partnership in the CIS markets. The agreement provides for cooperation in media auditing projects as well as the integration of teams and resources. Kwendi experts will be engaged in some RMA's projects in Russia. Accordingly, RMA experts will contribute to Kwendi projects in Ukraine and the CIS. RMA and KWENDI will also offer joint media auditing and consulting services. RMA/KWENDI alliance aims to become the No.1 media auditor in the former Soviet Union in terms of the audited media budgets. KWENDI is the largest media auditor and consultant in Ukraine and partner of the international media-audit companies Billetts, EMM, Etat Control on the markets of Russia, Ukraine and other CIS countries. Founded in 2005. LUKOIL (LSE: LKOD) appoints RusMediaAudit and british EMM International to conduct media plan assesments for Russia, Ukraine, Turkey, Romania and Lithuania. "LUKOIL is the leading Russian oil company and one of the first Russian advertisers that use independent media consultancy on a regular basis. We are very proud to offer our joint with EMM services to LUKOIL", Dmitry Kuraev, head of RMA, said. Website and corporate identity designed by Orthographic. Please consider current site as a beta-version and kindly inform us about any issues. Russian website version will be launched shortly.